HP has today announced the arrival of its new laptop range. Catering for those who want that little bit more from their notebooks, the "entertainment-rich" HDX Premium Series is said to guarantee high-end mobile entertainment. Powered by Intel Centrino 2 processors, the notebooks come with HP MediaSmart software and offer some home cinema-style tweaks. These include: a Blu-ray disc player, integrated TV tuner, Altec Lansing speakers with a triple bass sub-woofer that will knock your socks off, and Dolby Home Theater. The HDX series comes in two screen sizes: 16-inch (HDX16 ) or 18.4-inch (HDX18) and are available from October for £999 (16-inch) and £1199 (18-inch). For those with more of an eye on the sartorial, HP has also announced the launch of its fashion-conscious Pavilion range of notebooks. There are six in all, four of which take the HP name (dv41000, dv3500, dv5 and dv7) and two that go under the Compaq Presario banner (the CQ70-100 and CQ60-100). The dv41000 is the pick of the bunch when it comes to elegance. Likened to a Saville Row suit in the press release (!!?!!) the notebook features HP's 'Intensity' Imprint design and is aimed at the home-cinema market. 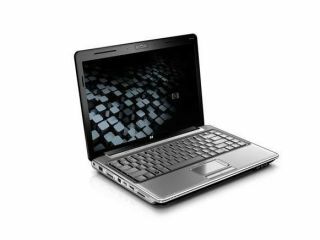 The 15.4-inch HP Pavilion dv5 and 17in dv7 Entertainment go for a 'Intersect' HP Imprint finish and are equipped with the latest (unnamed) Intel processors and a widescreen display. The dV3500 houses a smaller 13.5-inch display, a 512MB NVIDIA Geforce 9300 chipset and is allegedly the perfect partner for 'fun'. The 17-inch Compaq Presario CQ70-100 and 15.6-inch CQ60-100 cater for the budget-conscious, starting from £399 when they hit shops in October. The HP DV range is also out in October, with prices ranging from £699 to £899.